Is a 12% annual return with no down months a legit expectation? Let me Google that for you. They say there’s no such thing as a stupid question. They are wrong. Ask stupid questions, get stupid answers. 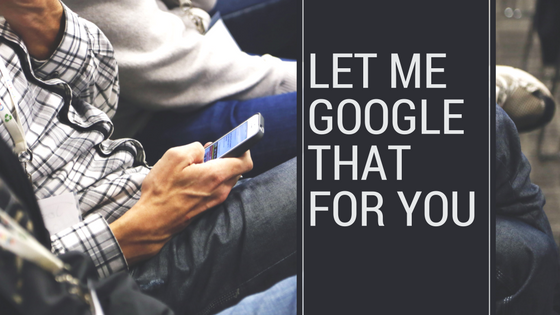 The Let Me Google That For You website is the perfect passive-aggressive answer to many stupid questions. Rather than simply answering the question, LMGTFY provides a link that walks through the steps to google the answer. For example, “How much does a polar bear weigh?” Why do I bring this up? As I have mentioned in other posts, sometimes all the due diligence you need can be found with a quick Google search. Harry Markopolos says he’s uncovered some huge due diligence mistakes by the Boston Transit Authority (MBTA) and at least some of them would have been avoided with a quick internet search. If you’re unfamiliar with Harry Markopolos, he’s a modern day Cassandra. Markopolos warned about the Bernie Madoff Ponzi scheme for years before it collapsed. The authorities didn’t act on his information even as he brought them more and more damning evidence, but in the end he was vindicated. One of the amazing facets of the Madoff case was how supposedly sophisticated investors were taken in. Investment experts who should have been asking hard questions dropped the ball. Many figured that since other sophisticated investors had already put their money with Madoff, he must have passed their due diligence. They effectively outsourced their due diligence to an absentee investment committee. Markopolos says the MBTA invested in a ponzi scheme run by a former MBTA executive director as well as a different ponzi scheme run by the son of a con artist who stole $400 million from Hollywood investors in the ’70s via (surprise!) ponzi scheme. These are actually the small issues with MBTA’s pension fund. In 2015, Markopolos questioned the legitimacy of the pension’s returns. The methods used to calculate assets changed often and they had an auditor resign. Returns were incredibly high. While beating benchmarks isn’t a red flag, beating benchmarks by 6 or 7% USING 70+ MONEY MANAGERS is. This is going to be painful to unravel, especially since politics plays a role in the MBTA pension machine. It’s another sign of just how important it is to have the right people performing real due diligence rather than appointing a rubber stamp committee overseeing other people’s money.